In 1877, the Northern Pacific (NP) Railway decided to resume construction of its main northern branchline west to the Yellowstone River near Glendive MT. Administrative offices and a passenger depot would be necessary on the west side of the river. Under the direction of General Thomas Rosser (of Fort Lincoln fame), the one-story 24-feet by 70-feet structure was constructed including its gable roof and a surrounding 12-foot platform. Three years later, this depot was retasked as a freight storage building and a new depot was built. The first depot turned warehouse was later sold in 1912 and moved from the site. Its replacement was designed by McKim, Mead and White who designed both the original portion of the West Wing at the White House in Washington, D.C. as well as the NYC mansion of NP president Henry Villard. It was 100-feet long and 32-feet wide. The brick first floor was topped with a wood framed-second floor complete with hipped wall-dormers for the windows. A cupola with a bell-shaped roof topped the building. The Queen Anne style building was surrounded by an 8-foot wide verandah supported by ornate iron pillers. The trackside platform was 400 feet long and could accommodate up to 8 passenger cars. The ground floor, level with the platform, had accommodations for employees and travelers. The express room was 14 x 30ft in size, the ticket office was 13 x 18ft, and the baggage room was 14 x 30ft. Per the custom at the time, a 29 x 39ft ladies' (and children's) waiting room was separate from the gentlemans' 29 x 30ft waiting room, so the women would not be exposed to "rough language" common among men. Construction started in June 1882 and was finished in November 1882 at a total cost of $12,000 ($270,000 in 2010 dollars). In addition to the railway management offices, housed on the second floor was the Western Union telegraph office where up to nine operators were on duty 24-hours a day. The "battery room," was filled with lead-acid wet cell jars which provided back-up electrical power. East of the depot was a plain one-story building housing the dining room and lunch counter; commonly referred to as "the beanery." In all, the building was described as the finest depot on this side of St. Paul. 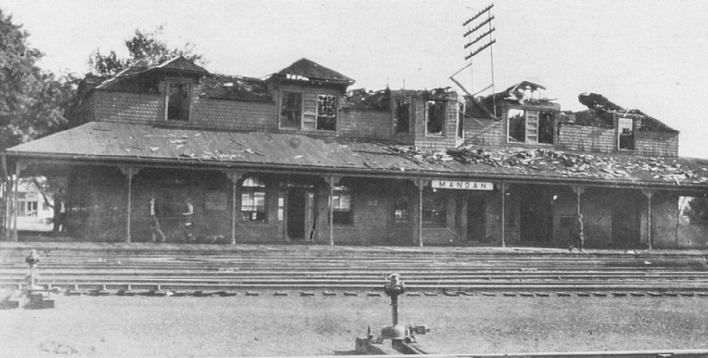 A major fire in June 1920, caused by defective electrical wiring, destroyed the entire wood second story of the building. Furniture, tickets and records were rescued from the first floor, but the contents of the telegraph, yardmaster, roadmaster and trainmaster offices on the second floor were completely destroyed. Temporary offices were set up in extra caboose cars parked on sidings east of the beanery. Since the Railroad was loosing money at the time, it decided just to rebuild the second floor with a very plain design (it replaced the "shingle" siding with straight stick wood siding.) 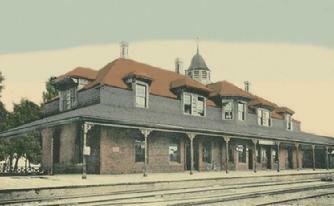 After receiving a new coat of paint, the line operated with this depot until 1929 when it was replaced with the current "colonial-style" depot. 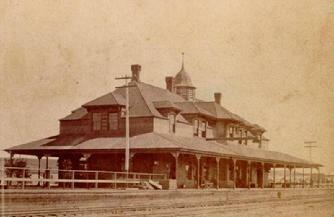 See [Area Landmarks] --> [NP "Colonial" RR Depot].